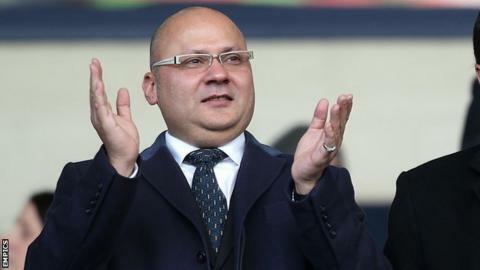 Birmingham City acting chairman Peter Pannu has announced another delay in their holding company's annual results. The Birmingham International Holdings Limited (BIHL) accounts for the year ending 30 June 2011 have yet to be submitted after several delays. And last season's financial results, up until 30 June 2012, have now been delayed to 31 October. Pannu also told the Hong Kong Stock Exchange that BIHL's AGM is held no later than 15 November. The announcement means that BIHL now have two years' worth of accounts unpublished. With club president Carson Yeung in Hong Kong facing money-laundering charges, Pannu was last week appointed chief executive of BIHL. Blues are not officially up for sale but their long-term plans having become even more clouded over the last 15 months since owner Yeung was arrested. The club rejected a £25m approach to take over the club from former QPR chairman Gianni Paladini earlier this month but Pannu went on the record back in May to say that they were open to offers of new investment. After making light of their off-field problems to reach the Championship play-offs last season, this term's results suggest that the continued concerns over their long-term future may be taking their toll. Following manager Chris Hughton's departure to Norwich, Blues have won just two of their first seven league matches this time round to stand 19th in the Championship. And last Saturday's second-half collapse against Barnsley led to a 5-0 defeat - their worst home league loss in 25 years.